climate change could could hit food production in the some of the world's poorest countries and widen the gulf between the industrialised countries and the rest. India could be one of the worst hit. These findings were presented by Mahendra Shah, researcher on land use at the Austria-based International Institute for Applied Systems Analysis ( iiasa ) at 'Challenges of a Changing Earth', a conference on climate change held in Amsterdam. The study, combining the latest climate-change models with detailed data on global land use, reinforces the long-debated argument by developing nations at climate change negotiations that the developing nations suffer the most from the human-induced changes in the climate by the North-based countries. Method The Food and Agriculture Organization ( fao ), in collaboration with the iiasa , developed the Agro-ecological Zones ( aez ) methodology and a database of worldwide distribution of land resources. Together this enabled an evaluation of biophysical limitations and production potential of major food and fiber crops under various levels of inputs and management conditions. iiasa used the fao digital soil world map for constructing a land surface database consisting of more than 2.2 million grid cells within a raster of 2,160 rows and 4,320 columns. The data was collected on climate, soil type, terrain, vegetation and crop type. It was then segregated for each cell and collated country-wise, regionally and globally. The agricultural potential of 28 crops at three levels of farming technology was assessed for the changes that would be effected by the changes occurring in the climate. The three levels of farming technology were classified as farming with high level of inputs and advanced management; two, farming with intermediate level of inputs; and third, improved management and low level of inputs with traditional management. The assessment considered a total of 24 crop species, two pasture types, and two fodder crops. Altogether, 154 crop and land utilisation types were studied, each at the three defined levels of inputs and management. The researchers compared the current conditions with those predicted by the three most widely-used climate change models. Each grid was evaluated for specific climate, soil, and terrain constraints to the crop production in that grid. Estimation of the extent of rain-fed and irrigated cultivable land and potential for expansion was estimated. The land in forest ecosystems was also assessed for its potential as new areas for cultivation of food crops. Then the regional impacts and geographical shifts of agricultural land and productivity potentials and implications for food security resulting from climate change and variability were studied. Other inputs used to conduct the study were the fao soil association and attribute database, a global elevation and derived slope distribution database, the global climate data set of the climate research unit of the University of East Anglia and a distribution map of 11 aggregate land-cover classes derived from a global one-kilometer land-cover data set. The 78 developing countries studied for the impact climate change on food security were classified into three groups according to the proportion of undernourished in each country's total population -- those with 5-20 per cent undernourished (group one), 20-35 per cent undernourished (group two) and more than 35 per cent undernourished (group three). The aez assessments were carried out for critical years in the past as well as to build scenarios of future climate based on various global climate models. The results, therefore, assess the impacts on land productivity as it has occurred in the past as well as the potential future change. Though maps presented with the report show that warming and increased carbon dioxide levels will increase global food production over the next 70 years, at the same time, these factors could force about two billion people living around the equator to endure large cuts in food production. Brazil, India and many sub-Saharan African countries could lose out to climate change; winners could include Russia, China, Canada and Argentina. "The world will gain overall but there are profound concerns for these losing countries," says Mahendra Shah, the report's coauthor. Equatorial zones will get hotter, researchers calculate, making current crops harder to grow. Temperate areas -- parts of North America, Russia and China -- will get hotter and will experience more rainfall, allowing agriculture to spread further north. This trend was predicted as far back as 1994 , but the new report is the most comprehensive analysis of it yet. "This is the most thorough biophysical measurement of global agriculture and forestry to date," says Ferenc Toth, researcher at the Potsdam Institute for Climate Impact Research in Germany. Global warming will lead to higher temperatures and changes in rainfall, and this in turn will modify the extent and productivity of land suitable for agriculture. For example, a temperature increase of 3C paired with a rainfall increase of 10 per cent in the developing countries would cause a decrease of 11 per cent productivity that could have serious consequences for food security in a number of poor developing countries in Africa, Asia, and South and Central America. Globally the cereal production could fall by 100 million tonnes by 2080. In the developed countries, rainfed cereal production with high level of inputs could decrease from the currently estimated 1.9 billion by some 15 million tonnes in the 2080s. In the developing world as a whole, where production is measured to be about three billion tonnes currently, cereal production could fall by 90 million tonnes. However, there are wide variations in the impact of climate change for individual countries. 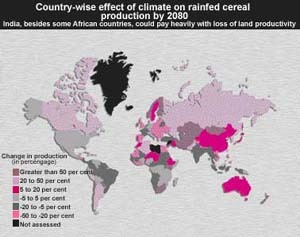 Sixty-five developing countries, representing more than half the developing world's total population in 1995, could, lose about 280 million tonnes of potential cereal production as a result of climate change. This loss, valued at an average us $200 per tonnes for cereals, totals us $56 billion. In East and South Asia, where at present two-thirds of the world's 800 million undernourished live, the impact of climate change is mixed. India according to the scenario developed by the study stands to loses a massive 125 million tonnes, equivalent to some 18 per cent of its rainfed cereal production potential.